Mexico: Is Peña Nieto Missing the Point? The disappearance and apparent massacre of 43 students from a city in Mexico’s Guerrero state is a rude reminder to President Peña Nieto that economic reform and increased foreign investment aren’t enough to help the country overcome the scourge of narcotics-fueled violence. 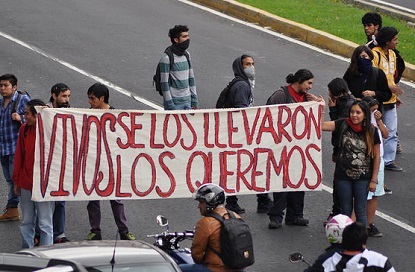 Federal and State prosecutors agree that the police in Iguala – who, along with the city’s mayor, have strong ties to the Guerreros Unidos cartel – handed the students over to the narcos after a confrontation during a student protest turned violent, already leaving six students dead. Residents on a nearby ridge noted an increase in police and truck traffic soon after the showdown, but the dozens of bodies uncovered by searchers at mass graves in the area so far have not been the students’. The mayor and police chief are in hiding, but Federal authorities say three dozen police and accomplices have been arrested and many have confessed. None apparently has identified where the bodies were dumped. As the scope of the crime, which occurred three weeks ago, has become clearer, the President’s rhetoric has been increasingly forceful, committing to investigate and bring the perpetrators to justice. The Federal police have been directed to take control of security in the area and nearby municipalities. The government announced last Friday, that the “supreme leader” of the Guerreros Unidos has been arrested, while another committed suicide after a standoff with police. But critics point out the federal authorities’ own problems with corruption, and criticism of Peña Nieto’s efforts to stem the violence has been growing, especially in the wake of his administration’s many self-congratulatory statements about progress in the security area. A new 5,000-strong national civilian gendarmerie he rolled out in August was ridiculed as too little, too late. His continuation of his predecessor’s emphasis on arresting drug kingpins – resulting this year in the spectacular arrests of Joaquín “El Chapo” Guzmán Loera (of the Sinaloa cartel), Héctor Beltrán-Leyva (of the Beltrán-Leyva Organization), Fernando Sánchez Arellano (of the Arellano Félix cartel), and others – has failed to eliminate the underlying systems of the drug trade. During the presidential campaign in 2012, Peña Nieto promised to reduce violence, and his decision not to obsess over the problem – as his predecessor, President Calderón, had – may have given him a respite. But his administration apparently ignored clear signals of trouble – such as indications that in Guerrero state and elsewhere the cartels’ were expanding and consolidating their influence over government – and the problem seems to be roaring back with a vengeance. The President’s focus on reforming the economy and attracting foreign investment makes strategic sense, but its long timeline doesn’t help him fight the fires of violence that envelop parts of the country. There’s also merit in creating something like the gendarmerie and other institutional tools, but that approach seems to ignore that the rot of corruption has deep roots at all levels – federal, state, and local – that must be dealt with and that an elite unit tied to a federal capital hundreds of kilometers away can do little in places like Guerrero. Calderón had shown the challenge wouldn’t be easy, but Peña Nieto has not yet shown that he – and Mexican society – are up to it either.